Led Zeppelin have turned down an offer to headline this year's Download Festival, says Andy Copping, the event's organizer. Speaking to XFM, Copping said that having both Led Zeppelin and AC/DC on the same bill would have been a dream come true. "If I could get Led Zeppelin to play at Download, it would be phenomenal," he said. "If that's not going to happen, I'm more than happy with what we've got. 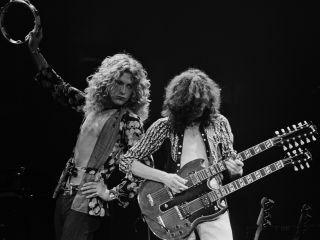 "Every single festival in the world approaches Led Zeppelin or their management to get them to play at their festival," Copping continued. "Loads of money gets thrown out. It's not what they want to do at the moment and that's fine. They probably never will, but everyone has a stab at it." Although Zeppelin aren't playing the Download Fest, the band members are keeping busy: Robert Plant is recording a new solo record as well as a follow-up to Raising Sand, his Grammy Award-winning smash with Alison Krauss. Meanwhile, John Paul Jones is a member of Them Crooked Vultures - who are, in fact, booked for the Download Festival. As for Jimmy Page, his plans are less definite, although he did recently say that "the most important thing for me right now is to make some new music." Even without Led Zeppelin, the Download Festival, which runs 11-13 June at Donington Park, Leicestershire, has lined up AC/DC, Rage Against The Machine and Aerosmith as headliners, with support acts such as Stone Temple Pilots, Motörhead and Wolfmother, among many others.